Harold is having eye drops put in but doesn't like it at all. Dorothy enters and says that they must improve fire safety in the street, trees overhanging fences could have caused the fire to spread. Dorothy says she will ensure everyone will take fire safety more seriously. Candice leaves for the weekend, Paul is very impressed with her. Caroline defends Melanie but Paul thinks she is a loony! Helen is talking to Dorothy about signing over the Scholarship money to Diane. 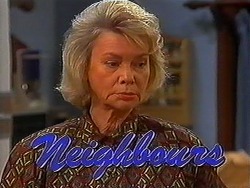 Dorothy tells her not to give in as it's what Derek wanted, Helen is worried about Beverly. Eddie is here to drive Harold to work just as Jim arrives home looking very sharp. 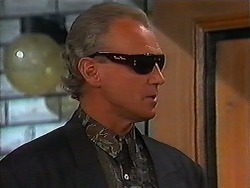 Slick backed hair, sunglasses and an expensive looking suit is Jim's new look! Matt and Joe are messing around as Dorothy enters; she wants Joe to look at some trees in her garden. Dorothy asks Joe if there is a fire extinguisher in the house, he isn't sure. She says everyone must take fire safety more seriously, there is a meeting tonight about it, Joe says he can't go but Dorothy implies that Joe could get some work out if it so he agrees; she gives Matt a stern look so he agrees to go as well. 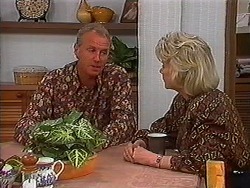 Jim says he met some high powered people in New York; it seems they are wearing very similar looking shirts! 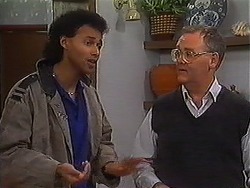 He asks about Beverly, Helen tells him she would give it another go and he should go to see her. Candice, Caroline and Paul are discussing restaurants, he invites Candice out for dinner, she then casually mentions that she wants to work in PR, and Paul says there might be a job for her one day. Caroline is unimpressed with potentially hiring inexperienced people based on looks. 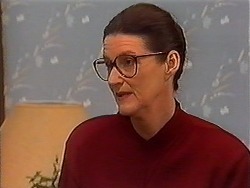 Helen agrees to attend Dorothy's meeting, Madge won't go because she thinks there is nothing wrong now the fire is over. Dorothy wants to know about the Neighbourhood Watch scheme, she says the manager of it has not been doing their job, it turns out Helen is manager and can't remember the last meeting they had. Dorothy decides there will be one tonight after the fire safety meeting, Helen isn't very pleased. Jim arrives to talk to Matt who is unhappy about Jim hiring a drunk to replace him while he was away. 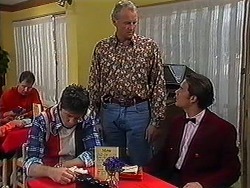 Jim apologises to Matt. Harold comes outside to speak to Madge; she wants him to rest more because of the fire. 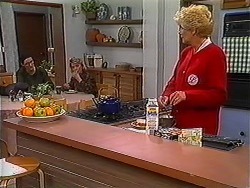 Madge says she misses Eddie as he arrives, he doesn't like his new flatmates so Madge says he can move back in with them. Candice says she will bring in some references in case a PR job comes up, once again Caroline is unhappy. Matt comes in to speak to Paul about Jim, he doesn't even know he is back. Matt wants to know when the workshop will be open again, Paul says he will talk to Jim. 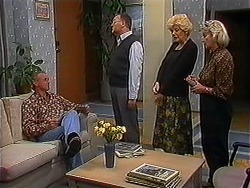 Helen, Madge and Harold head to Dorothy's meeting as Paul arrives to talk to Jim. He says that people shouldn't just leave their responsibilities. Jim says he had a lot on his mind and his time away helped him to gain a new perspective. Dorothy's meeting is coming to an end; everyone has some different jobs including trimming trees and clearing gutters. Dorothy then starts the Neighbourhood Watch meeting, she makes Helen apologise for not running regular meetings! She then resigns from the Watch scheme and runs out, she is clearly upset! Caroline, Matt and Joe all decide to leave as well. Madge tries to leave but Harold stays to tell Dorothy how good the meeting was, he offers his services to the Neighbourhood Watch scheme as Madge yawns. Paul tells Jim about putting the workshop into a chain, Jim agrees, he has other idea about what to do but he won't tell anyone yet. 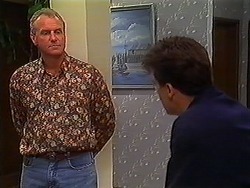 Helen arrives home and tells Jim to speak to Beverly. 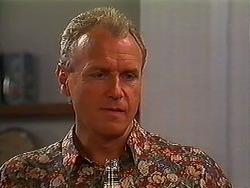 Helen tells him that Beverly phoned him in New York and a woman answered, Jim says it's none of her business and leaves.